My friends and I are always exchanging recipes and looking for new meal ideas, so I decided that I would post some here once a week, in case others are looking for meal ideas too. In our family we have some with picky palates (i.e. picky eaters! LOL) so I often have to modify and edit recipes, like pureeing Ro-tel and such. So a lot of the recipes I use can be easily adapted for different tastes. I also do not love to cook, so my meals are quick and easy, or they are a no-go here! First I prepare the noodles per directions on the box. While they are boiling I cook the hamburger meat, drain, and then add the seasonings and sauce. 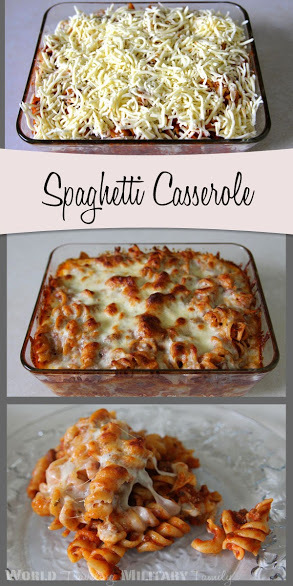 I then mix it with the pasta and put into a 9×7 glass baking dish. You could easily put it into a 9×13 as well. Sometimes I will put it into two 8×8 disposable pans and cook one and freeze the other for later. If you freeze one I just put it frozen in the oven at 350 for 1-1.5 hours and presto an easy meal with no work! Then I top with cheese, we like a lot of cheese! Bake at 350 for 20 minutes or until cheese is melted, our oven cooks really hot and it only takes about 15 minutes. Super easy and quick to make! 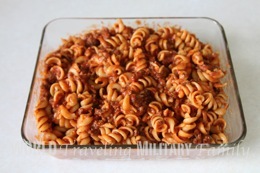 If your family is less picky you could easily add things like mushrooms, bell peppers, olives, etc but here plain is the favorite. 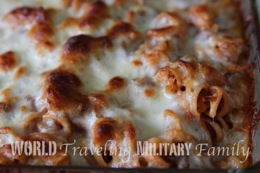 Quick & Easy Spaghetti casserole for whole family. Prepare the noodles per the instructions o the box. While they are cooking, cook the hamburger meat and drain. Add seasonings and sauces to the cooked meat. 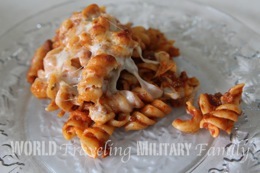 Then mix it with the pasta and put into a 9x7 or 9x13 basking dish. I often use 2 disposable 8x8 pans and cook one and freeze the 2nd for later. 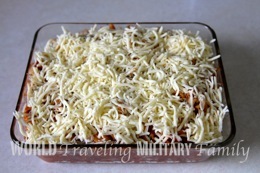 Top with the cheese and bake at 350 for 20 mins or until cheese is melted. 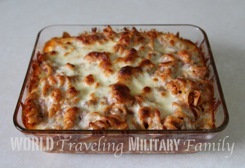 If your family is less picky you can add peppers, olives, mushrooms, etc to the casserole, plain works great here. I also make it without the meat many times too. If you freeze one I just put it frozen in the oven at 350 for 1-1.5 hours and presto an easy meal with no work!